On 26-27 November, 2012, the European Union hosted a workshop on “Effective Programming for Countering Violent Extremism,” in Brussels, Belgium. The workshop brought together key experts and practitioners on Countering Violent Extremism (CVE), as well as third party representatives from the Horn of Africa, Yemen and Pakistan. The ACSRT was represented at the workshop by H.E. 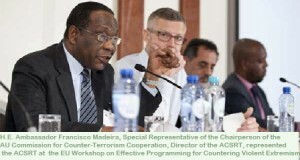 Ambassador Francisco Madeira, Special Representative of the Chairperson of the African Union Commission for Counter‐Terrorism Cooperation, Director of the ACSRT. The workshop was convened by the EU to address the nexus between development and security, and focus in particular on how the EU can better understand and support third countries in their efforts to address violent extremism and recruitment. In addition, the workshop outcomes provided guidance for the Participants included EU officials from the development and security sectors, as well as experts across a range of relevant issue areas, including governance, the media, faith-based organizations and counter-radicalization and programme evaluation. The EU has drafted Strategies for the Horn of Africa and Yemen, and for Pakistan. These include considerable focus on preventing recruitment and violent extremism, and an appeal the EU to undertake programming that engages local government and nongovernment stakeholders. This workshop allowed participants to discuss steps that can be taken to implement these action plans and consider how this might be done in a way that promotes local ownership and is mindful of the need to allocate limited resources in a cost-effective and strategic manner. During the workshop, participants were invited to consider possible areas of intervention: messaging, media, education, supporting local, cultural and religious traditions, and de-radicalization, with particular focus on the two regions under consideration. Addressing the workshop, H.E Ambassador Francisco Madeira shared with the participants the conclusions and recommendations of the seminar on “Radicalization, Violent Extremism and De-radicalization in East Africa and the Horn of Africa, Experiences and Perspectives ”, which had taken place in Addis Ababa two days earlier, from 22 to 24 November 2012. He emphasized the threat to the continent represented by radicalization and violent extremism, and the effect of these two phenomena in the development of terrorism. He recalled the efforts of the African Union in the fight against these phenomena, citing the Dakar and Tunis Declarations, as well as the 1999 Convention of the Organization of African Unity on Preventing and Combating Terrorism and the 2004 Additional Protocol relating thereto. The Ambassador added that terrorism is complex because it is more than a ordinary criminal act undertaken for personal gain or collective material benefit. It is a combination of ideological factors, social grievances, conflicts, political and socio-cultural frustrations, personal or collective identity claims, misinterpretations of religion and history, economic and social marginalization, exclusion and other aggravating factors that pose challenges which the society struggles to correctly and effectively address. These challenges form centres from which violence, instability and recurrent insecurity spread, thus producing conditions which contribute to the creation of a conducive environment for radicalization, an environment in which movements, ideologies and extremism mutually reject each other, an environment in which mutually exclusive philosophical, political, religious, ethnic and violent nationalists theories develop; an environment in which terrorism takes root and strives becoming attractive to some ill-intentioned individuals, who make it their policy instrument of choice. Ambassador Madeira also urged participants to continually identify gaps in the fight against terrorism and to propose new, practical and realistic solutions to address it. He however stressed that military, police and intelligence measures, while necessary, are not sufficient to counteract the phenomenon of terrorism. This is because disruption of activities of terrorist groups and prosecution of suspects and perpetrators of criminal acts have proven insufficient. It has now become necessary and urgent, he said, to adopt a holistic approach, which combines the security approach with preventive actions in other domains including, governance, education, the promotion of democratic values, economic development and the fight against corruption. Finally, ambassador Madeira highlighted the importance of dialogue amongst religions, and amongst religious and community leaders. He urged governments to also involve the civil society, the media, religious leaders, community leaders, Non-Governmental Organizations (NGOs), think tanks, universities and research centres in their effort to counter radicalization.